Welcome to Miamisburg, Ohio, where you’ll find more to explore! This progressive suburban community of 20,000 has grown to become an ideal destination in the Miami Valley. From bike trails to art galleries, from museums to the metro parks, and from farmers markets to casual bars and eateries, there’s plenty to see and do in Miamisburg. Since the early 1990s, the City of Miamisburg and community members have actively supported the revitalization and historic preservation of downtown Miamisburg. The authentic downtown district and the Victorian homes surrounding the downtown area give the city its charm. Extensive preservation efforts have kept structures like the Baum Opera House, Market Square Building, Gebhart Tavern and Kercher Cabin alive for generations to come. These historic sights, as well as the largest conical Native American burial Mound east of the Mississippi River, are must-sees. Not only will you love the sights, but you’ll love the people as well. Get to know the locals at the weekly Farmer’s Market. Annually, the town gets together for auto shows, bicycle races, carnivals, open-air art shows, and more! We hope you will continue to explore this website to discover all there is to see and do in Miamisburg. 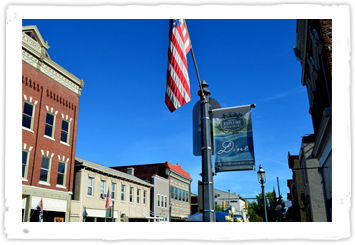 This site was created by the City of Miamisburg to promote Miamisburg’s historic downtown. To make inquiries about business opportunities in Miamisburg, please fill in and submit the Economic Development Inquiry Form (Click Here).